Kenyans voted in a presidential-election rerun that President Uhuru Kenyatta is guaranteed of winning after his main rival withdrew, as protests erupted in some opposition strongholds. 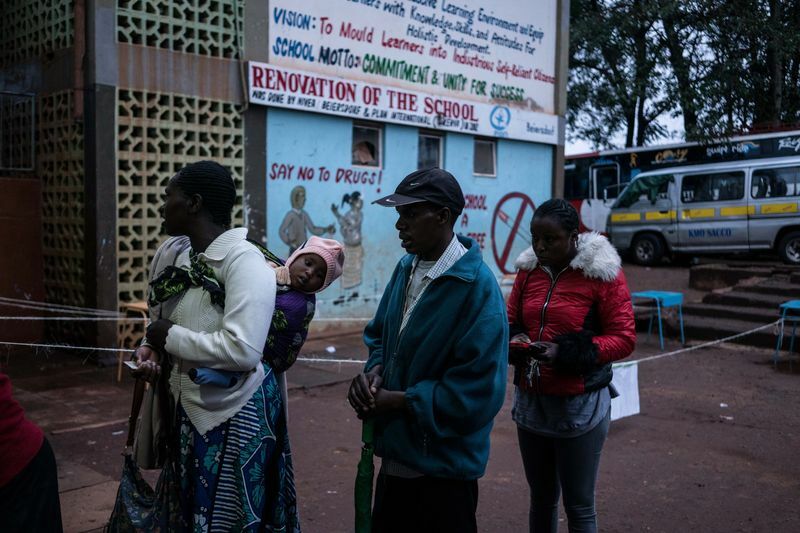 Early turnout was much lower than the previous election on Aug. 8, with only handfuls of people arriving at polling stations in the capital, Nairobi, when they opened at 6 a.m. to cast their ballots. Police fired teargas to disperse opposition protesters in the Nairobi slum of Mathare, while demonstrators erected roadblocks on the main road into the western city of Kisumu, a key support base for opposition leader Raila Odinga. “People are throwing stones so we have had to move into this hall under one roof, but even now we are still not comfortable, we are not safe,” said Hawa Hassan, an electoral official in charge of the Heidmarie voting center in Mathare. Kenya is repeating its election because the Supreme Court last month overturned Kenyatta’s victory after finding the vote wasn’t conducted in line with the constitution and the electoral commission committed “illegalities and irregularities.” Odinga, the leader of the main opposition alliance, withdrew from the rerun on Oct. 10 saying the fresh vote “would be worse than the first one,” as his demands for staff and system changes at the commission, along with other reforms, were ignored. A last-ditch bid by three petitioners to have the Supreme Court postpone the rerun failed on Wednesday after only two of the court’s seven judges showed up for the hearing, leaving the tribunal without a quorum. The High Court rejected a similar case, saying it didn’t have jurisdiction on the matter. Uncertainty about the election has weighed on Kenya’s financial markets. The Nairobi Securities Exchange All Share Index has fallen the most in Africa since the election outcome was declared void on Sept. 1, according to data compiled by Bloomberg. The government’s international bonds due in 2024 have also dropped since then, with yields climbing 36 basis points to 6.38 percent. Election controversies have become routine in Kenya, a regional hub for companies including General Electric Co. and Toyota Motor Corp., since it became a multiparty democracy in 1991. The most catastrophic followed a disputed vote in December 2007 that deteriorated into clashes across the country and claimed at least 1,100 lives. As many as 67 people have died in protests since the August vote results were announced, according to rights groups including Amnesty International. Odinga’s four-party alliance has campaigned against what it calls a “sham election.” Wafula Chebukati, the chairman of the Independent Electoral & Boundaries Commission, has said he can’t guarantee a credible vote, because of political interference in the political process. On the eve of the vote, Odinga said his coalition has transformed itself into a national resistance movement that will embark on a defiance campaign as it seeks to ensure “fresh, free and fair presidential elections” are held within 90 days. The outcome of the rerun maybe overturned by the Supreme Court again if it doesn’t conform with the constitution, Dismas Mokua, an analyst at Nairobi-based risk advisory firm Trintari, said. Posted by Above Whispers on October 26, 2017.